I have been craving pasta and not just any pasta, but slippery gratifying ribbons of tagliatelle, a pasta style that I am yet to find as a commercial gluten free variety. There has been a fair amount of pasta slurping going on around me at home recently. I usually ignore the temptation and prep myself some more Vietnamese spring rolls or a quick stir fry. But there is something about freezing temperatures which make it difficult to enjoy overdosing on raw veg. This is definitely the time of year for something a little more substantial, so besides cooking up another batch of Nomato sauce & soup I am drawn towards a bowl of pasta. I was pondering on the merits of different types of pasta and the differing attitudes to fresh egg as opposed to dried pasta. It dawned on me that cooking pasta al dente must vary according to the type of pasta you start with. I am a bit British in my pasta tastes and tend to like my pasta cooked through. The one exception to this is Spaghetti Vongole where I expect my spaghetti to have a little bit of bite. So, if you are making and cooking pasta from scratch, how do you achieve that bite? as fresh pasta in my experience is chewy rather than brittle? 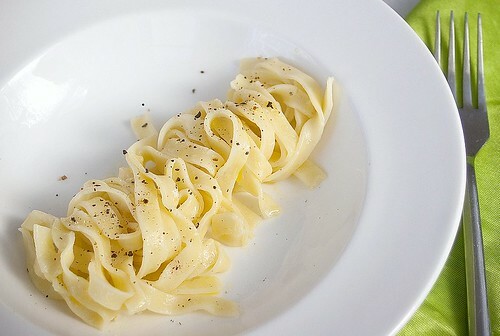 And if you can't get that al dente bite with fresh pasta, is the 'al dente' concept traditionally Italian? It is all a bit meaningless I know, but that is a small and possibly scary insight into the workings of my mind! Making pasta is not hard work as long as you are well equipped but it is, like all recipes that require special equipment, a leap of faith to invest in the first instance. You can use this recipe for making spaghetti or tagliatelle, as well as hand shaping traditional Italian pasta. One of my favourites is orechiette (little ears) which are easy to make from tiny chunks of dough - you can even make these without a roller, which might be worth a go before taking the plunge. I bought my pasta machine yonks ago, from Ikea. It sat for ages in its' box quite literally gathering dust (and grease) on a top shelf above the hob for ages. I used to gaze on the box proudly "look, I've got a pasta machine" but it was rarely used. Since I started a gluten free diet, this has all changed. A new place in the cupboard with the mixer and my food processor means it is easy to reach for and my diet has vastly improved with the addition of egg noodles, wonton wrappers & potsticker dumplings - all products of my beloved pasta roller. It is difficult to know whether a pasta machine is a good investment for you, but have a think about this. Try to make this recipe, by hand, rolling out the dough. If you like the taste, are not put off by the effort and find yourself thinking about making it again (having forgotten your aching arms and tired hands) then buy a pasta machine! By the way, the ikea machine has fixed tagliatelle and noodle rollers on the same machine, so it was a versatile investment. I haven't seen one in Ikea since but I know that they crop up on ebay intermitattantly selling for around a fiver under the brand / model name Ampia 150, worth the investment I think! I wanted to retain the yellow hue of traditional egg pasta, so besides the eggs I have included some yellow cornmeal in the dough. If you can't eat corn, then substitute this with millet (for the yellow look) and potato starch for the corn starch (I can't eat potato starch so don't usually include it). 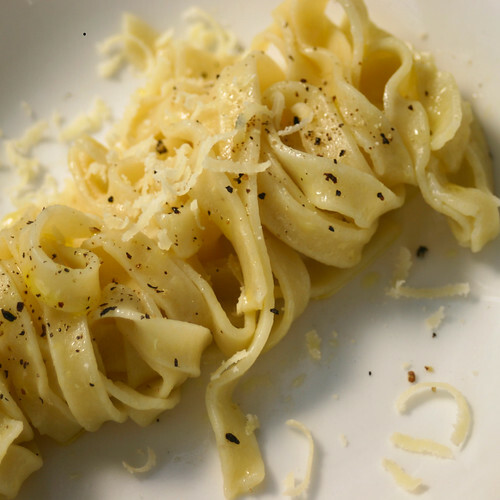 Egg pasta doesn't need to be rolled as thinly as noodles and wrappers which will be a bonus if you are doing this by hand, on the pasta roller I rolled from settings 1 - 5 before passing each sheet through the tagliatelle cutter. Keep the rest of the dough in a plastic bag whilst not rolling it. If the outer skin of the dough is dry when you start, wet your hands slightly and squeeze the dough until it is just moist (not sticky) and pliable again. You can dry the finished pasta fully if you like, simply by leaving it in the open air, turning each pile of noodles to ensure they are open to the air, then store in an air tight box. Alternatively you can drape noodles or spaghetti over a drying rack (I have used a clean clothes airer). If you don't want to dry them you can put them straight into an airtight box and freeze until you need them. When I have room in the freezer, I also freeze the 'dried' ones in case I haven't managed to dry them completely. Whilst I was taking the photos I was snacking on the left over cooked pasta with remnants from my fridge. I discovered that this pasta tastes great with tuna, cooked green beans, toasted hazelnuts and garlic oil topped off with a grating of Sussex Charmer cheese (more on this later). Fantastic Kate! I am sending link this to my coeliac/gluten intolerant loved ones... thank you! No obligation - I won't be offended. Sounds great, I will give this a try by hand. I am in the States and converted your recipe to US measurements. I also could not find kuzu starch so I substituted potato starch flour. When I passed the dough thru the pasta machine I couldn't make regular length pasta as it would break apart. Do you think the substitutions contributed to this or am I doing something wrong? Also, how long should I cook the pasta? Thank you for any help you can provide as I have been looking for quite a while for a good gluten free pasta recipe and I think yours looks great. PS I also like your blog a lot! Hi Kate: I tried your G/F pasta and it was a great hit. Do you have a recipe for G/F Bread?? I am glad you like the pasta, if you want to email me (address in my profile at top of page) I can send you a bread recipe or 2! Hi Kate: Did you receive my email requesting a couple of G/F bread recipes? Hi Kate, I would like to make you G/F pasta. I am wondering where I can buy the glutinous rice flour? I seem to have a problem getting hold of the G/F type. Please help! Many thanks. Hi Jessica. All glutinous rice flour should be naturally gluten free, though it might become contaminated whilst packing / processing. In the UK you can get glutinous (or sweet) rice flour in Asian supermarkets, it doesn't tend to be labelled as gf but I have not had any problems with it. I am quite sensitive but there is always a slight risk with eating non-tested (unlabelled) gf products. If you have a strong food processor or vitamix you could try grinding glutinous rice yourself and then sieving out any remaining solids - though i haven't tried this myself. If you can't get hold of kuzu, you could try using 2x amount of ground chia seed (rather than potato starch that someone else mentions). The Clearspring brand of kuzu is available in health food shops in the UK.